Automation has always been a popular concept. Once a staple of science fiction lore, it’s now become part of modern daily lives. One example is office automation which began back in the day with basic document management. It wasn’t long ago that everyone used typewriters and filing cabinets to manage their office documents, until PCs emerged in the 1980s. 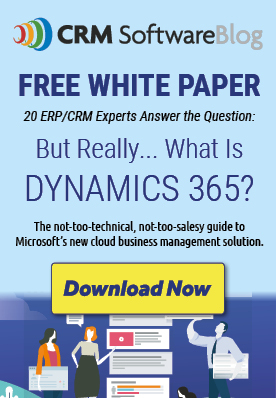 Microsoft Word eventually became the norm, followed by landmark products Microsoft Office in 1990, Office 2003, and eventually more sophisticated present-day technology like Dynamics 365. There’s no question that a CRM can help your company with sales, marketing, customer service, and more but what about document generation? This is where Xpertdoc comes into play. When integrated with CRM, Xpertdoc fully automates the processes for the generation, management, storage and delivery of business documents. 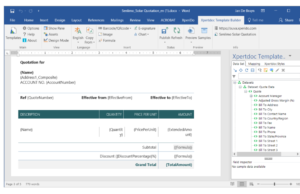 Not only can you design document templates but business users can visually model and deploy document workflows leveraging data from any available source (like Dynamics 365), addressing the most complex document scenarios while eliminating the need for technical knowledge or coding skills. The very first step of the document generation process is connecting your data source like MS Dynamics 365 for example. Once that is done, you’ll need to create a data set. Not to worry, it’s not as technical as it sounds. A data set is just a collection of business data in a database. 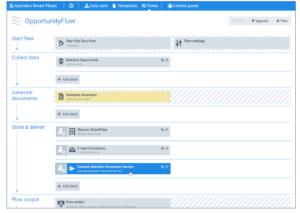 Xpertdoc Smart Flows for Dynamics 365 features an updated Data Set Builder with a modern user interface and easy navigation, i.e. no programming skills required. Now that you’ve got your data set, it’s time to design your template using our Microsoft Word-based Template Designer (check out a previous blog post on best practices for template design) The ability to combine data sets from multiple sources into a single template allows you to tie up loose ends in one fell swoop. You decide to create customized templates for different regions, which your sales force can access via a dashboard. With your customized template, you can auto-fill information for your repeat customers, which saves time and creates a more efficient customer experience (CX). Once your template’s in place, you’re all set to run a document flow. There are more wide-reaching benefits of a document generation system, such as content search capabilities, e-signature support and more. You can archive templates, creating a personal library of enterprise information. The Single Sign-on authentication feature of Xpertdoc Smart Flows eliminates the need to remember passwords, providing a fast and easy connection. And speaking of connecting, you can enjoy flexible deployment options, either onsite or in a public or private cloud. A modern document generation tool like Xpertdoc provides more automated capabilities and a competitive business advantage than old fashioned document management. 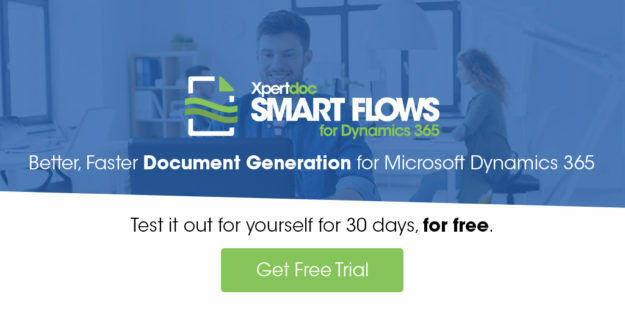 To learn more about Xpertdoc Smart Flows for Microsoft Dynamics 365, request a free 30-day trial and follow us on Twitter: @xpertdoc or visit www.xpertdoc.com for more information.